The 2200 is a brilliant mix of performance and value. Borrowing heavily from the 2500, the 2200 achieves a remarkable level of resolution at the price point. The 2200 platter is machined from a solid block of stress-relieved acrylic. Its thickness, like the thickness of the 2200 subchassis, is closer to the thickness of the 2500 platter than to that of the 2000. The surfaces that mate to the bearing are derived from the Debut platter/bearing mating system. A large horizontal diameter forms the vertical mating surface. The result is undetectable vertical motion of the 2200 Signature platter as it rotates, meaning less woofer pumping and less amplifier strain. 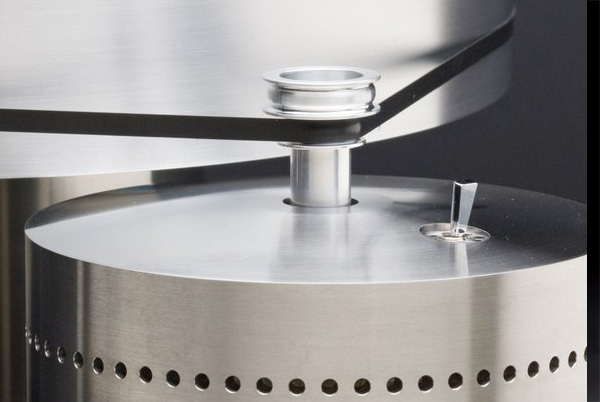 The vertical motion of the rotating 2200 platter is equivalent to the thickness of a human hair or less. The radial location is provided by a pair of concentric cylindrical surfaces, which provide superior accuracy to the ubiquitous tapered shaft so often seen in lesser products. The superior radial precision of this fit forces the outer belt-driven surface of the platter to be perfectly centered, again guaranteeing the great speed stability of the 2200 Signature. In his review for The Absolute Sound, Paul Seydor writes: "I’ve been setting up turntables and listening to vinyl for almost forty years, and as a reviewer I’ve had opportunities to hear under pretty reliable conditions many of the high-end turntable/arm combinations that are thought to define the current state of the art. Ironically, I’ve never heard the higher Basis models. I assume they must be better, but until I do hear them, the 2200/Vector has for me redefined what is possible in the playback of vinyl sources." 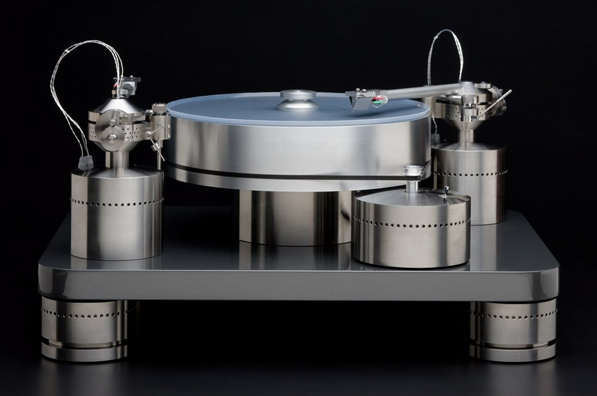 »The Absolute Sound Basis 2200 Signature with vector 4 tonearm. »HIFI News Basis 2200 Signature. 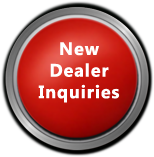 Color: Clear acrylic, silver trim. 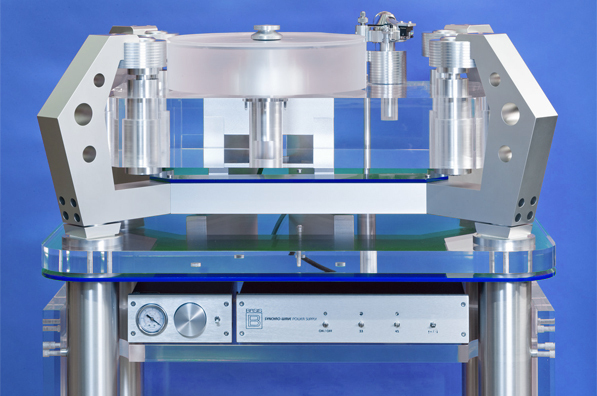 At the top of the Basis 2000 Series are the models 2500 Signature and 2800 Signature turntable with vacuum clamping. 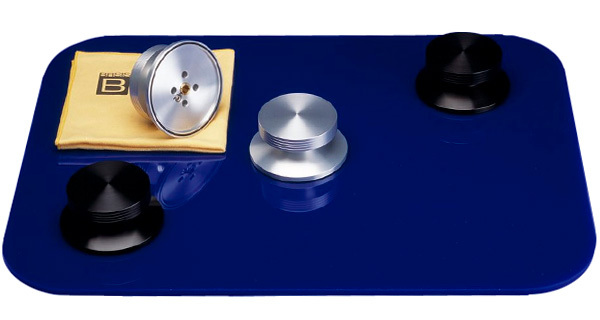 Their 2" thick composite platter (same as is used on Debut turntable) sits on an ultra-close tolerance bearing which is mounted to a massive 2", stress-relieved acrylic plinth. 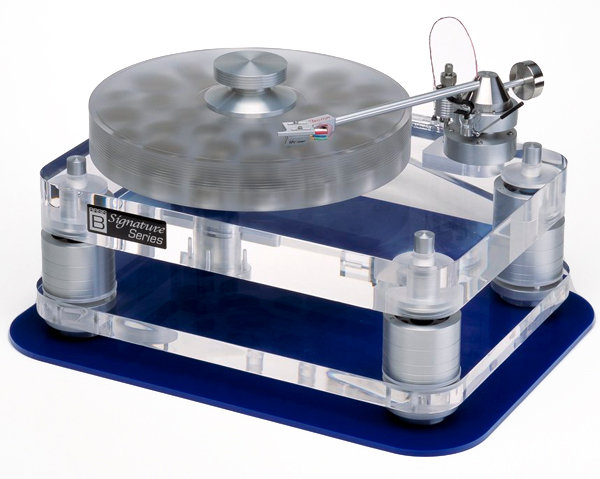 The optional Basis Vacuum Record Hold-Down System applies a controlled level of negative pressure to the underside of the record guaranteeing a perfectly flat record that is so effectively coupled to the platter eliminating any vinyl resonance. Each record becomes a twenty-pound record! Tests of record outer rings, never considered at Basis due to resonance problems of their own as well as the danger they present to the stylus, show only a twenty percent coupling compared to the Basis Vacuum System. The vacuum system restores even the most warped record to exact flatness, eliminating speaker damaging and power robbing “woofer pumping” due to record warps. Dynamics, imaging, musicality, bass power, and tracking ability are all brought to levels thought to have been unreachable until the Basis Vacuum system. 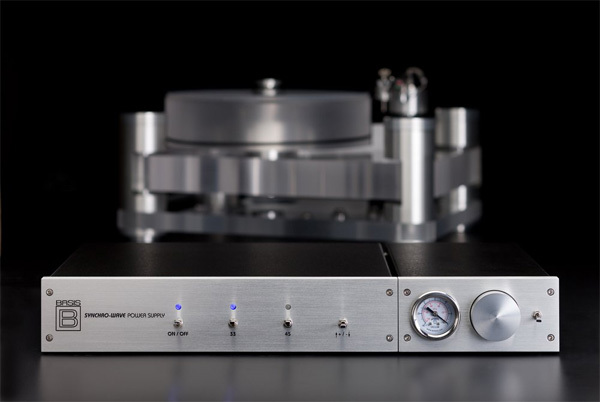 » The Absolute Sound 2800 Signature with vector tonearm. » 6 Moons 2800 Signature with Vector 4 tonearm. The Inspiration package includes syncro-wave power, Vector 4 tonearm, vacuum, and microthin belt. 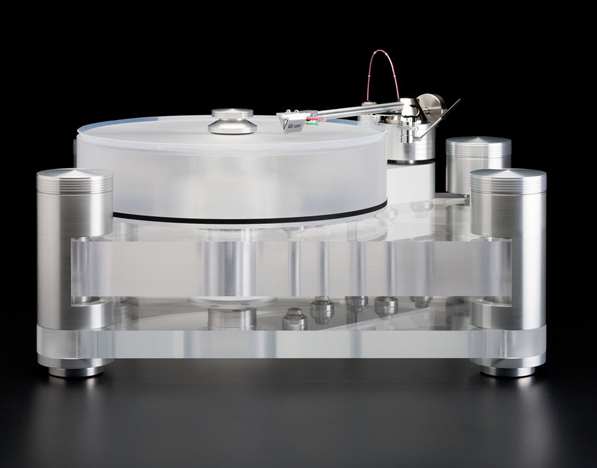 » The Absolute Sound (Robert Harley) for the Inspiration Turntable and Vector 4 tonearm. No expense was spared in the creation of the Work Of Art. With this turntable, Basis Audio offers a product that represents the summation of their well respected engineering and fabrication abilities. All the knowledge gained and lessons learned over A J Conti’s entire career have been poured into this project. For the ultimate in neutral sound, the support structure for the suspension must be extremely rigid with any resonant frequency falling outside the audio range. The Work of Art supports in each corner are massive, machined from billet, architecturally shaped beam arms. To eliminate flexure, the support arms are over-engineered to such a degree that each could support a full sized truck despite being cantilever beams in nature. To further reduce deflection at predominant natural frequencies the cross-sectional area of each arm is modulated as a function of height. The moment of inertia of a structural beam is directly proportional to the third power of the thickness, with the flexural properties gaining a concomitant third power change in magnitude. Along with the lack of parallel sides on any surface of the structure, the results are supports that are massively rigid with a randomized resonant response well above the audio range. The sonic result is a structure which forms a perfect, neutral hanging point for the fluid damped suspension system. The AJ Conti Transcendence is a fully isolated turntable, offering the advantages of immunity to outside noise, floor vibration, and other feedback inducing energy that would greatly degrade the sound of other turntables. 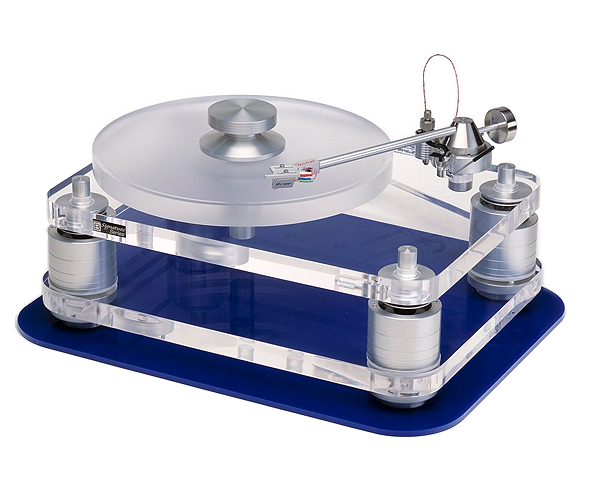 This turntable will deliver the same state of the art sound in any installation circumstance. We have measured Wow and Flutter of nearly every belt drive and direct drive turntable on the market. Nothing meets the .01% that almost all manufacturers specify. The best speed stability of any turntable other than Basis turntable is .025%, very fine performance, but this is 150% worse than the incredible speed stability of the AJ Conti Transcendence. Total weight: 220 pounds including vac pump, vac controller, Synchro-Wave power supply. Weight of turntable assembly only: 185 pounds excluding Synchro-Wave and vac components: 185 pounds. Dimensions, L x W x H, inches: 21.575" x 16.125" x 11" to the top of the tonearm. Height: to the top of the tonearm wire loop: 14". The Vector tonearm is the result of this evolutionary process, incorporating the same principles of engineering and physics that have made Basis turntables known and praised for their refined, natural, musical sound and neutrality. 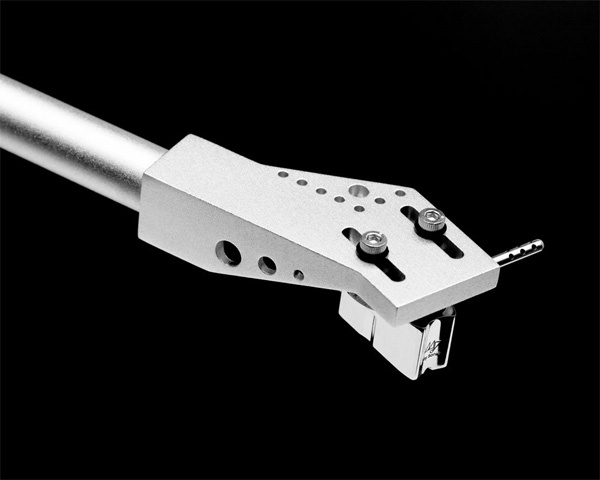 The Vector 4 tonearm utilizes a hybrid bearing featuring a point contact, .020” radius polished male pivot fabricated from hardened tool steel. The female cup is ground and polished from sapphire and is precisely radiused to achieve self-centering with the pivot. The entire weight of the tonearm is concentrated on the primary pivot, with an innovative stabilization bearing controlling azimuth as well as guaranteeing stability of the vertical rotational plane of the stylus. This new, advanced bearing system solves the problems with all previous fixed bearing arms (bearing chatter, lack of azimuth correction) as well as the problems with unipivot bearings (azimuth “rocking” reaction reducing bass and dynamics, “loose” hand operation, unstable azimuth reaction to vertical record warps). 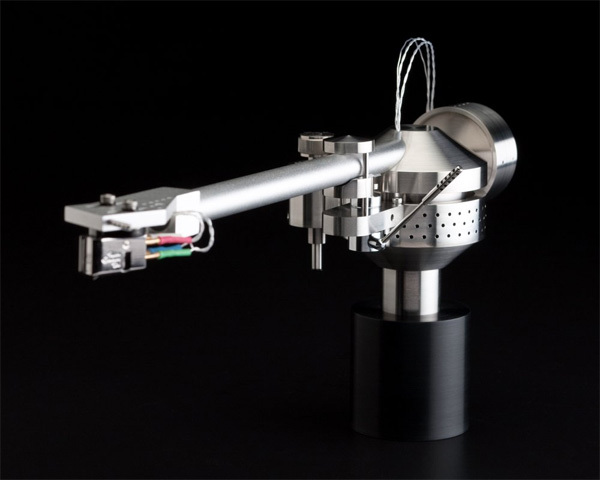 The result is a tonearm of superior sonic performance and tracking, guaranteeing reduced record wear. In design for two years, the Basis “Perfect Signal Transmission Technology” (PSST) phono cable follows the normal Basis practice of starting with the basic physics. In the audio range, capacitance and inductance of a cable changes radically as the frequency changes. The nature of the complex functions of impedance, capacitance, and inductance are asymptotic, stabilizing at extremely high frequencies, but substantially changing at audio frequencies. Basis employs it's “Distortionless Transmission Line Theory”, balancing cable properties to achieve the single set of conditions which will result in perfect signal transmission. The result is a phase coherent cable whose sonic traits are those which one would expect from superior phase coherency: great clarity, seamlessness and an impression of sound sources “floating mid-air”, with the speakers “disappearing”. 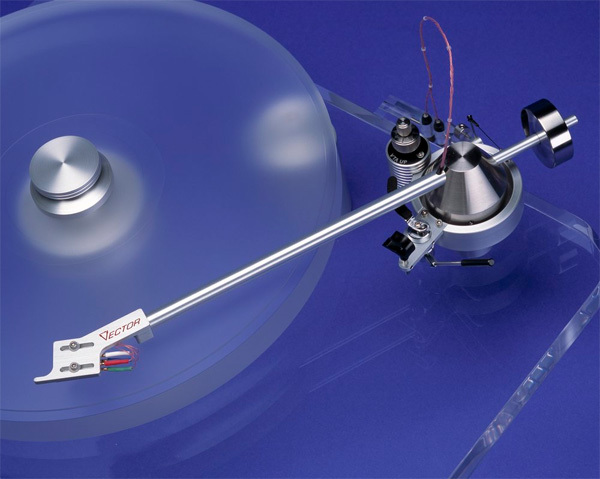 The elimination of ringing in this system can only be accomplished through the effective use of viscous damping, achieved in the Vector Model 4 tonearm by the use of stable viscous silicone damping fluid and substantial effective damping paddle area. Currently, the Vector tonearm is alone in effectively supplying the required amount of damping in all planes to prevent ringing due to underdamping. Anyone who has experienced the large difference .10 grams makes in tracking force and cantilever compression would agree that this amount of sidewall force could destroy records and reduce sound quality if not negated. For this reason, the Vector utilizes adjustable anti-skating, with a bias weight that can fully cover the range of anti-skate necessary even for the heaviest available cartridges. “The Arm (Vector 4) is a true masterpiece”. The Basis Reflex Clamp has been in continuous production since 1988. It is a study in precision machining from aerospace materials to defense industry standards and fine finishing to perfectionist audiophile standards. Like all Basis products, the design was complete when introduced . Only one upgrade to the original design has been required, and the Basis Clamp is still the market reference in terms of effectiveness, quality, and longevity. The Reflex Clamp is available in black or silver. The Clamp is designed to mate with the smooth spindles on Basis turntables. Although the Basis clamp uses a smooth collet against the smooth Basis spindle, the precision is so high that a smooth turn of the knob will allow the clamp to grip tightly enough that the entire turntable may be picked up by the clamp alone without the clamp slipping on the turntable spindle. The underside of the clamp is undercut, leaving only the outside periphery of the clamp to contact the record. In this manner the clamp forces the record to “bow” downward slightly for better contact across the record surface. The clamp also increases the pressure on the platter/bearing interface for a more rigid coupling, which increases the precision of the motion of the outer, belt-driven platter surface. The flattening and improved coupling of the record to the platter reduces record resonances, resulting in smoother and more powerful sound with greater low-level detail and firmer bass. Slight improvements in imaging are noted due to the better damping of the record and firmer coupling of the platter to the record. The Synchro-Wave power supply brings Basis turntables to further heights of musical reality, delivering smooth, dual sine-waves with perfect 90 degree phase difference, of audio-amplifier quality distortion levels. Dual-wave motor operation: 2 individual sine waves with exact, optimal phase shift are fed independently to each motor coil. Stable, generated frequency of power. The benefits: Perfect long-term speed stability. With both long-term and short-term speed variations reduced to levels below the finest industry test records, the musical structure, timing, texture, and character create a "closer to a real musical event". The emotion and feel of the music is conveyed in a clearly more convincing manner, with all mechanical artifacts dissolving away. The Basis Synchro-Wave Power Supply, along with other features such as their “Revolution” perfectly ground belts, set higher standards for vinyl playback in terms of realism of tone, complexity and accuracy of instrumental decay, and sound space definition. Industry members have commented that Basis turntables with the Vector tonearm, Synchro-Wave Power Supply, and Revolution belt sound more like master tapes rather than records. The thickness of the belt factors into the calculation of the drive ratio of the pulley and platter. Different thickness belts will cause the driven pulley (platter) to run at different speeds. Changes in thickness along the length of a belt will modulate the speed of the platter. Round cross-section belts will attempt to roll in order to achieve the lowest potential energy state, in addition to their scuffing action and increased propensity to hunt. Any splice in a belt changes the effective radius as well as stiffness, causing spikes in the critical measured parameters of wow, flutter, and drift. As a result of the above facts, perfecting the belt drive turntable must first include perfecting the drive belt itself. As in any vibration isolation system, compliance and damping must be present for effective isolation. The ultimate speed stability cannot be achieved without near perfection in the uniformity of thickness along the length of a drive belt. In February, 2007, normal thickness precision-ground belts (the Basis Revolution Belt) were shipping with all Basis turntables. Basis had achieved the desired 1/10,000” (2.54 micron) tolerance on a production basis. The Revolution Belt has resulted in the speed stability measurements becoming “buried” in the error of their best test records. The current speed stability error is less than 35% of the error (65% reduction in cyclical speed drift) of the same Basis model with a non-Revolution belt, and of any other belt drive turntable ever measured at Basis. In February 2006, Basis commenced production of Revolution Ultrathin Belts, which are now shipping with the Basis Synchro-Wave Power Supply.